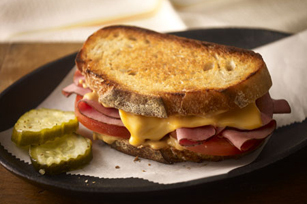 Roast beef and melty cheese are a classic sandwich duo. We tipped a hat to Memphis by adding hickory smoke barbecue sauce. Mix first 3 ingredients in small bowl. Spread bread slices with dressing mixture; fill with remaining ingredients to make 2 sandwiches. Cook in skillet sprayed with cooking spray on medium heat 3 min. on each side or until golden brown on both sides. Prepare using your favorite flavor KRAFT Barbecue Sauce.